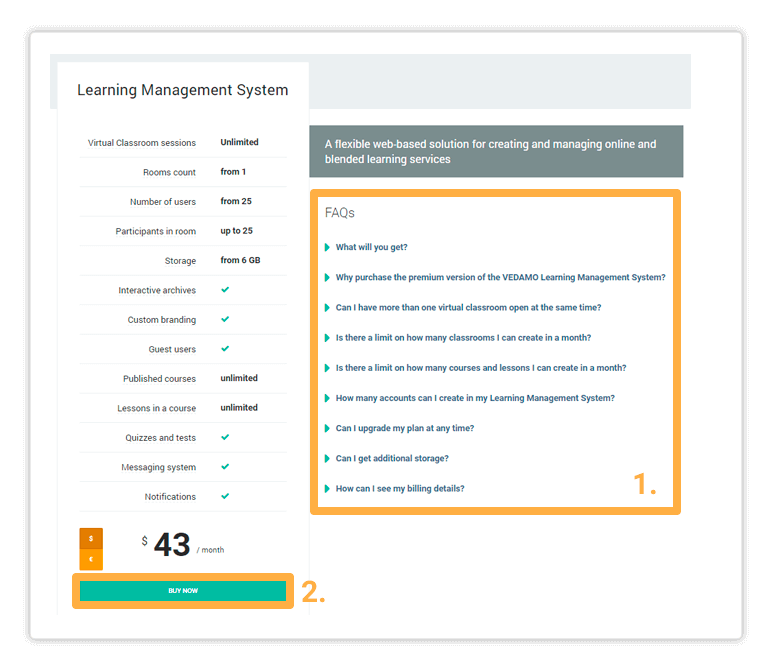 The Premium LMS Subscription for the VEDAMO Learning Management System offers a host of further benefits in addition to the features of our 30-days trial plan. 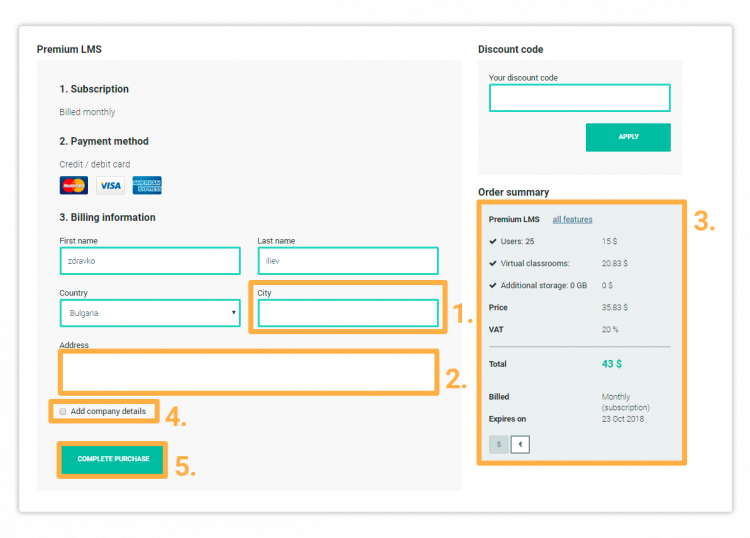 The article will detail the process to go through in order to find out what those benefits are, choose the subscription plan that’s right for you or your organisation and create your brand new Premium Learning Management System on VEDAMO. 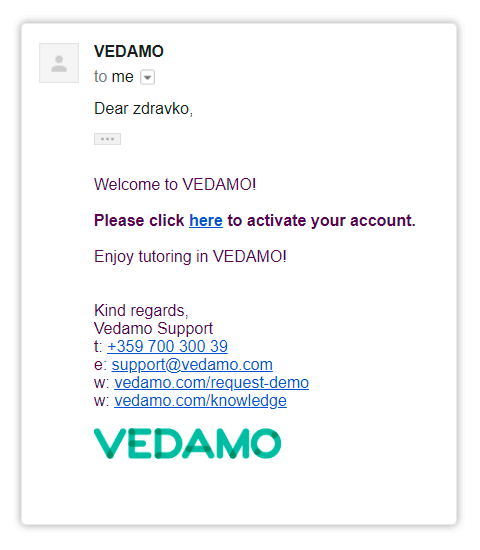 In order to create a new account and subscribe for the Premium LMS Subscription, please click on the Pricing page link located in the header of the VEDAMO homepage. 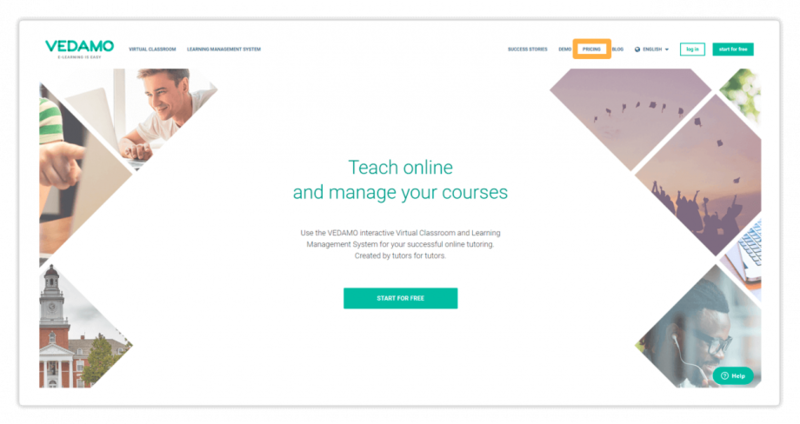 The pricing page of our website contains details regarding the VEDAMO Virtual Classroom and Learning Management System. Here you can check FAQs regarding the plan of your choice, see all of the features it will grant you and how they can help you. You gain access to a virtual classroom where one teacher can teach up to 25 students. You can also add more classrooms to your plan as necessary. The licence per classroom is 20 EUR and each licence allows you to open one more classroom at the same time. You also receive an additional 5 GB of storage space per classroom. 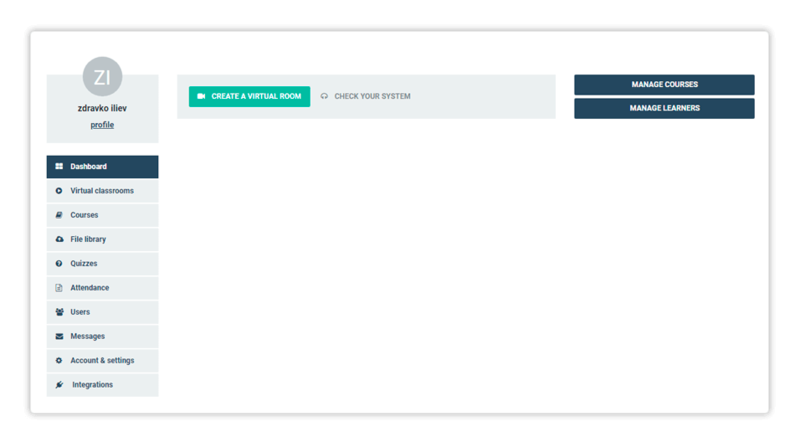 Allows you to open virtual classrooms where you can invite participants who have not registered an account on your LMS. Lets you view recordings of past lessons from the point of view of each participant. You can also download the recordings as a video file. Each registered user can see a recording of their past sessions through their account. Guest users, however, cannot access recordings. Allows you to create quizzes as part of a course or assign them directly to a group of students. 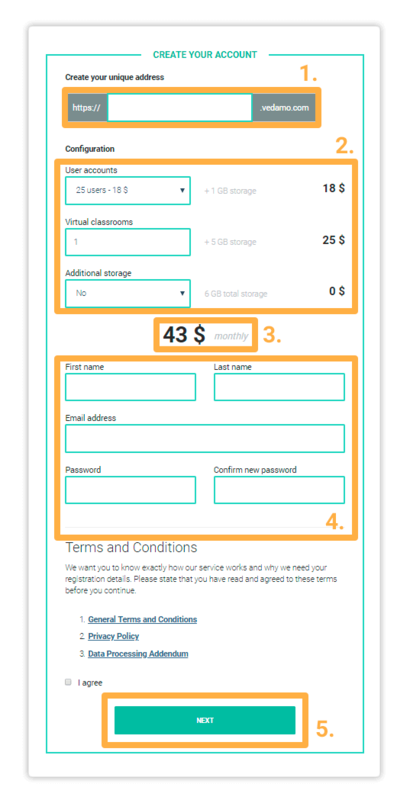 Grants you 6 GB of file storage ( + 5 GB per classroom licence). You also have the option of purchasing additional storage. You and your students will receive automatic system notifications for events in the system (e.g. student subscribes to a course, upcoming lessons, etc. ). Lets you upload a custom logo for your LMS and the virtual classrooms you open. For further details, check the article Account and Settings – General Information. Once you’re ready, you can click on BUY NOW to start the purchase process. On the next page, you will be asked to create your Account and select a name for your Learning Management System, as well as its features. Finally, if you want to add additional storage for file uploads and session recordings, you can do that through the Additional storage dropdown menu. The system will calculate the price of the features (3). Finally, put in your First, Email address and password (4) in order to create an account for the system. Your email address will be entered as the Organisation email for the system and your account will be an Organisation account. Finally, click on NEXT (5) to continue. This is how the page will look once all the fields have been filled in. The next menu lets you put in your City (1) and Billing Address (2). The Order summary (3) section lets you see the features you will be buying, as well as a breakdown of the price for each one and the overall price for the package. Tick the Add company details (4) box, to include your Company Name, VAT Number and Company number (5), which will appear on your invoice. Once done, click on COMPLETE PURCHASE to get to the payment page. Here is how the Billing details page looks when completely filled in. 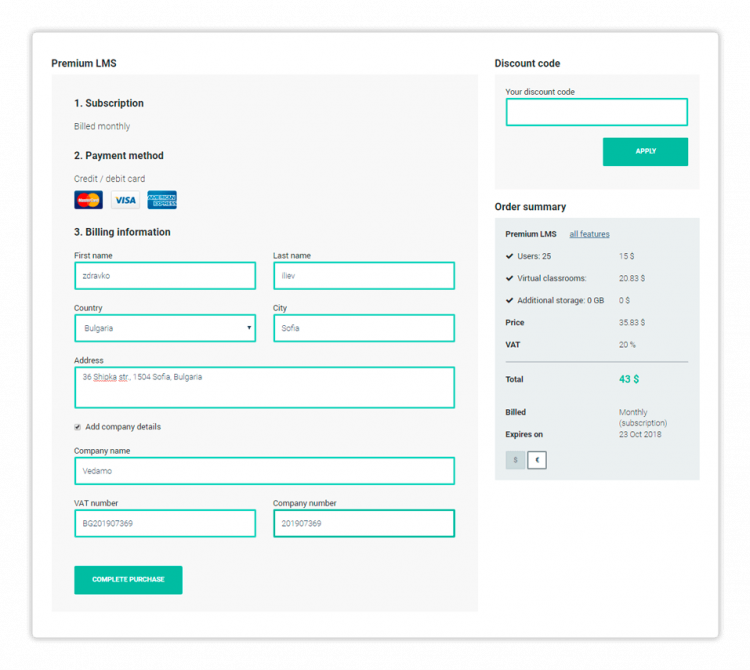 Next is the payment page, where you would input the final part of your billing details. Double-check if your Country (1) and Address are correctly entered, then put in your Zip code (2) and Phone number (3). 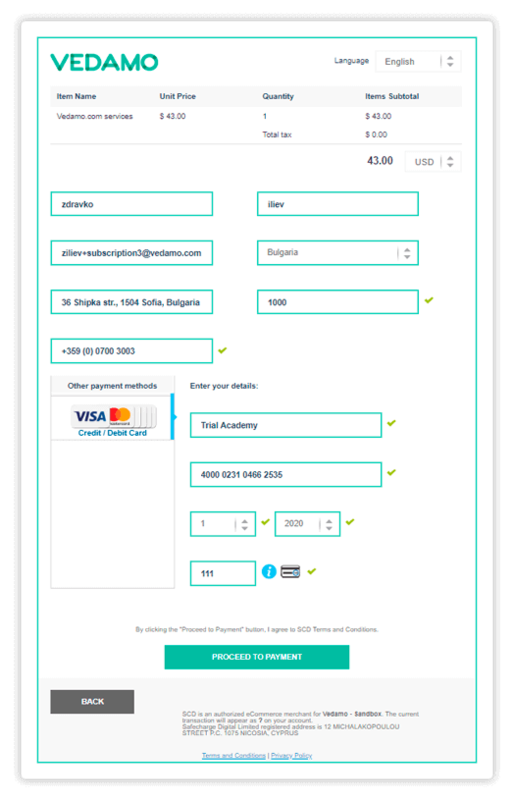 On the bottom of that page you have several fields where you would input your card details (4). Once done, click on CONTINUE to finalise your purchase. 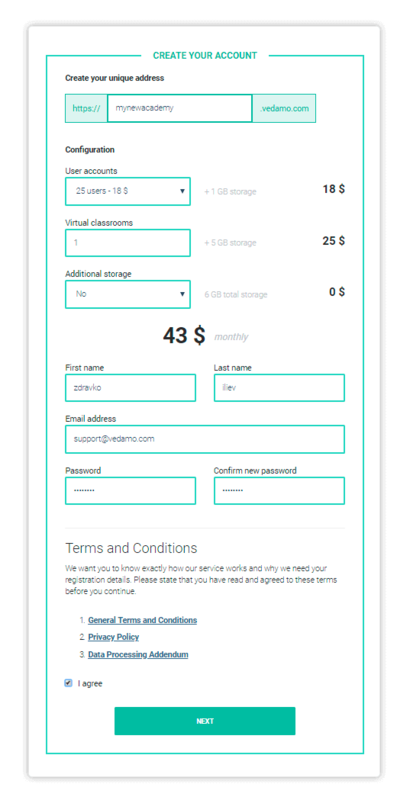 This is how the Payment page looks when completely filled in. Once the purchase has been completed, you will be redirected to a success page. 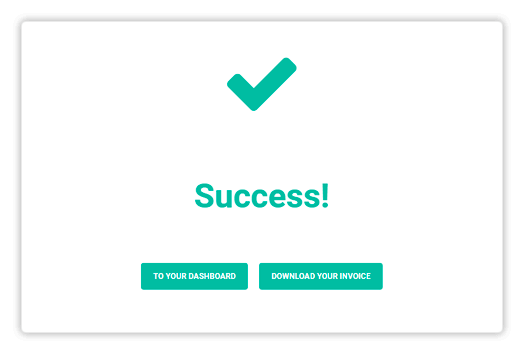 You can click on DOWNLOAD YOUR INVOICE (1) to receive your invoice right away. Click on TO YOUR DASHBOARD (2) when ready. 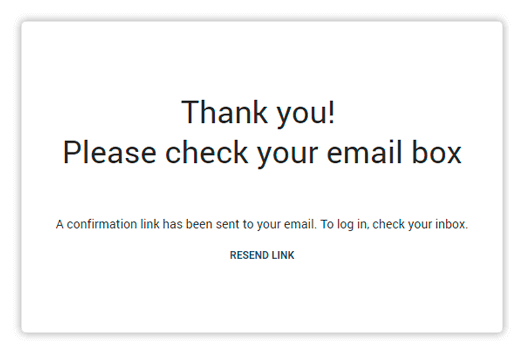 Finally, the system will alert you that you have received an email with a confirmation link. 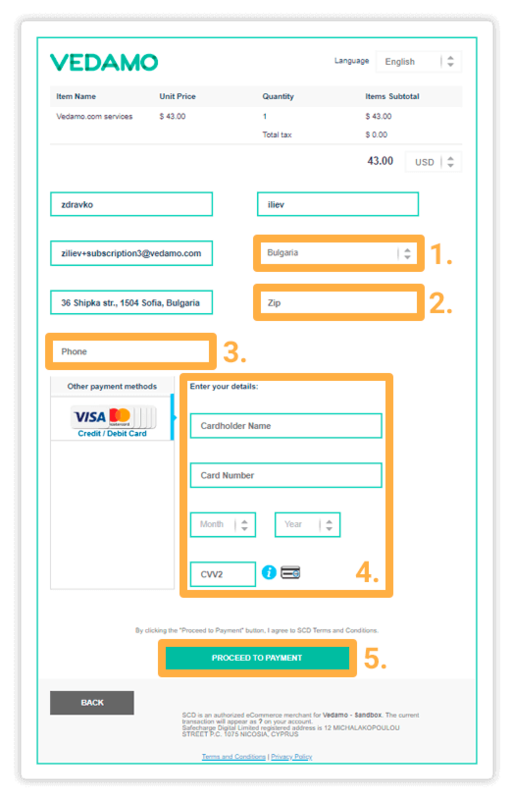 Go to the email address you registered for your account and click on the link in the email sent from VEDAMO to confirm your email address and access your account. The link will redirect you to your account dashboard. From there you can start using your newly created academy. To find more about the Dashboard and further features of your new Learning Management System, click on the NEXT ARTICLE below.